If you like action packed living then you will love the Devon Rex! They are funny and wickedly naughty expressing themselves in attention seeking mishap. They have amazingly huge eyes, massive ears, very lean and muscular bodies and lovely long kissable necks all wrapped in a luxuriously soft velvety curly coat. They have little neat paws that act like hands and use these with great dexterity to get 'just what they want'. They crave constant attention and woe betide anyone who ignores a Devon Rex, expect something of personal value to be broken or damaged in return. On the flip side they are extremely affectionate and loving to their chosen 'He' or 'She' Slave and slightly aloof to anyone new, unless..... you have a play toy! There is nothing more endearing than a Devon Rex kitten who's ears are too big, with little worried looks on their faces and with those huge eyes! They look like little bush babies and are so scrummy. How did the Devon Rex breed start? On the 15th July 1959 in Buckfastleigh, Devon, the very first Devon Rex was born, he was black smoke and curly, so they named him 'Kirlee'. He was born to a non pedigree queen out of an illusive large black cat with ringlets who prowled the local tin mine and was assumed to be the Daddy. a little Cornish Rex kitten was the only curly coated cat in Britain and it was then they wrote to the breeder (Mrs Agness Watts) saying, they too had a curly coated kitten. It was agreed that Kirlee would be purchased by a cat Judge and Breeder (Mr. Stirling-Webb) and that he would enter into a breeding program to the very limited gene pool of the Cornish Rex. At this stage Kirlee was thought to have the same mutation as a Cornish Rex, but with each mating he produced straight coated kittens, proving that (over a long time) Kirlee & the Cornish Rex were totally different mutations. In the early stages in the Devon Rex development, it was crucial to use some of those valuable Cornish / Devon variants to grow the breed. 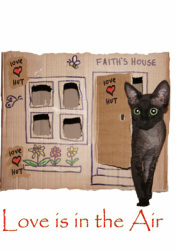 Interestingly, all Devon Rex's in their ancestry carry the Cornish Rex ancestry too. The Devon Rex mutation alters many things about the cat itself, one of course is the amazing wavy coat and the other is it's accentuated characteristics of our domestic feline. Devon Rex are very muscular, agile with longer hind legs and emphasized ears and eyes and longer body length. The ears are large, very wide at the base tapering to rounded tips set wide apart and low on the scull, which is flat. The head is a modified short broad wedge shape with high cheek bones. The nose is is short and has a definite stop. Their wide set eyes are large, oval with outer edges slanting to the outer edges of the ears. Eyes should have a devilish expression. The chin should be strong with a well defined whisker break. Devons should have long slim legs with neat oval paws as well as long fine tapering tails covered with short fur. Their fur should be short, dense and velvety in texture with neat waves covering the body and extending down the legs and onto the paws. A common sight is little fur on the underparts of a Devon and sometimes around the neck. Whiskers and eye brows are curly too and prone to breakage. Devons can take years to develop their adult coats and often kittens will drop all of their coats around 14 weeks and are covered in a fine down until it all grows back. On the subject of fur, some Devons have longer coats and plumed tails and others have no fur at all, even though they are not of breed standard and shouldn't be bred from or to, they make excellent pets and quite a surprising addition to any family that likes something 'even more different'. Devon Rex cats come in all sorts of colours and there seems to be no end to the new colours making their way to the show bench. Most cats in the early days were black smokes and a favourite colour even now. Is the Devon Rex suitable for Allergy sufferers? Lots of folks are allergic to straight coated cats but find they live along side a Rex with out too many problems. Although it's not a tested theory, if you spend a day with a Rex cat, you would soon find out! We have known people visit our home to be really bad allergy sufferers and say 'oh no, I didn't know you had cats' then have a panic only to find out they are not getting itchy eyes and sneezy noses. They do of course affect the sufferer if you don't sweep and vacuum regularly as the Devons do loose a little coat, but it never seems to 'get up your nose'. We have a Devon only household because Ade is sensitive to animal fur, but he can live happily with our Pride. If you are looking for a cat then why not visit and see if you can tolerate our Devons! What is the breeding policy? The Devon Rex has a very small gene pool and originates from very inbred cats, it is therefore important to introduce approved breeds to maintain good health and increase that all important pool of genes. 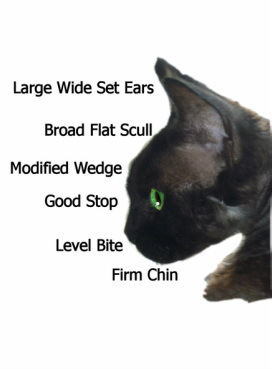 Only good tempered, lovable and healthy cats should ever be used and it is very important to choose good coat types and stay clear of faults in either line. There are three blood groups 'A', 'B' and the Rare 'AB'. All cats in a breeding program must be blood typed as problems occur to type 'A' kittens born to type 'B' queens. It also applies to a cat that may need a transfusion as well. There is more information about this on specific websites and it would take a whole page to explain it. 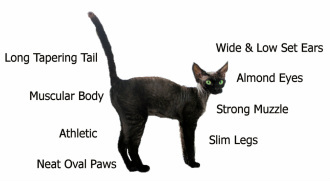 The Devon Rex Gene is inherited recessively, this means that one straight coated cat and a Devon Rex curly coated cat can make a selection of straight (variant) or curly coated (rex) cat babies. The straight coated (variant) can then go on to make more variant or Rex coated kittens. The term 'variant' is used for cats with coats that vary from their Rex coated parent.